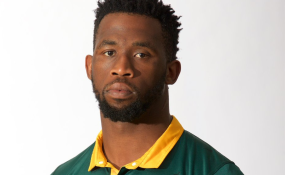 Cape Town — South African rugby captain Siya Kolisi has been the subject of heated discussion on Twitter for saying that Nelson Mandela would have not supported quotas. TimesLive reports that Kolisi made the comments during an interview with Kyodo News in Japan. During the interview, he is asked what he thinks former president Mandela would have said about transformation quotas in rugby. According to Kyodo News, Kolisi is in Japan to visit electronics company Panasonic. "Rather than just a face, his role with Panasonic is very hands-on. The first collaboration - with both parties adamant it will be a long-term project - between the 27-year-old and the Japanese company saw 10,000 solar lights donated to township kids to commemorate the 100th birthday of Nelson Mandela," says the publication. The interview, published on YouTube in three parts, covers Kolisi's impoverished upbringing in Zwide outside Port Elizabeth. Kolisi, the first black player to captain the Springboks in a test match, says: "Sometimes I used to go to bed with one meal a day. That's why I liked going to school because I was guaranteed one slice of bread and some powder milk." The interview covers the scholarship he won to the prestigious Grey High School in Port Elizabeth. In Part 3, The interviewer asks Kolisi if the thinks Nelson Mandela would have supported the quota system in place in South African rugby. "I don't think (Mandela) would have supported that," Kolisi said. "You shouldn't put a number on something like that... I wouldn't want to be picked because of my skin color." The Springboks are due to play Japan at at Kumagaya Rugby Ground in September.